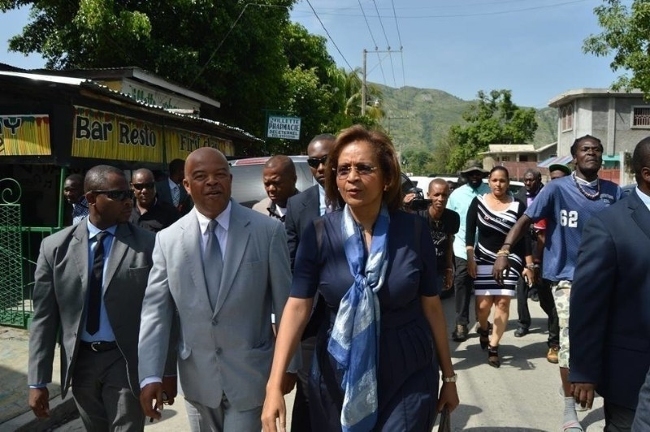 Presidential front-runner Dr. Maryse Narcisse, of the popular Fanmi Lavalas Party, is leading the independent polls setting her up for a likely victory in Haiti’s upcoming first-round election, scheduled for October 9, 2016. In a September 30th poll conducted by Sigma Stat Consulting Group & Association, an independent Haiti-based research firm that assists national and international organizations in assessing Haitian public opinion, Dr. Maryse Narcisse hovered at 51%. The poll included input from 2050 Haiti Community members from across the region. Former President Jean Betrand Aristide has endorsed Dr. Narcisse in her bid for the presidency, and has campaigned heavily on her behalf. A longtime advocate for democracy, health care, and education, Dr. Narcisse continues to work to advance social justice and combat environmental and agricultural abuses. With her vast experience and popularity in Haiti, Dr. Narcisse is the current front-runner to win the 2016 election as well as the most qualified to spearhead efforts to rebuild Haiti in the aftermath of Hurricane Matthew – one of the largest storms to hit the area in decades. Amid the storm, Dr. Narcisse continued her efforts to provide emergency humanitarian aid to the population of Port-au-Prince. A win for Dr. Maryse Narcisse would constitute a new beginning for Haiti, with a jumpstart for economic growth, agricultural innovations, and government efficiency. Dr. Maryse Narcisse, along with her presidential campaign director and senior adviser, Leslie Voltaire, is available for immediate interview about the Haitian presidential election. For more information on Dr. Maryse Narcisse or media inquiries, please emailor call 1.877.841.7244.